To make the hummus, combine can of chick peas, 1/4 cup olive oil, garlic, salt, 1 tbsp sesame seeds, cumin, sriracha, tahini and juice from one lemon in a food processor. Blend until creamy or fully incorporated. Adjust salt and lemon juice to your taste. To make the salad dressing, whisk together 2-3 tbsp olive oil, sesame oil, honey, balsamic vinegar, apple cider vinegar, juice and zest from 1/2 a lemon and 1 tsp sesame seeds. Set aside. Cut sundried tomatoes, olives, and mortadella to size. Assemble greens on a plate. Top with garbanzo beans, mortadella cubes, sundried tomatoes, and olives. In the center, place the grape leaves and decorate the top with a tomato peeled into a rose. 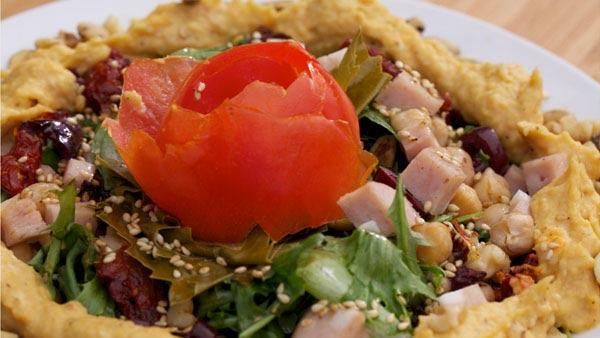 Design a circle of hummus around salad perimeter. Garnish with walnuts and pumpkin seeds.